If you develop apps for the Mac or IOS, there may come a day when code signing fails mysteriously. When this day happens, mix in a boiling cauldron 2 tbsp Eye-of-Newt*, 1 lb Toe of Frog, a healthy pinch of Wool of Bat, and honestly you can skip the dog's tongue - have you seen the places that thing has licked? Should this incantation neither fix your code signing problems nor make you King of Scotland, these terminal incantations are a good plan B. This tells you whether the app is signed, and it iterates sub-components. This tells you whether GateKeeper is going to run your app, and if not, why not. For example, if you get an error that an app is damaged and should be thrown in the trash, this command tells you something more specific, like that your certificate is revoked. This command outputs the fingerprints of the signatures used in the signing, as well as some thumbs up/down on the certificate chain. This is useful when an app's certificate is bad and you are trying to figure out which certificate the app went out the door with. * The former Speaker of the House may be unamused by this, but sacrifices must be made! There are two kinds of programmers: those that download a brand new version of X-Code on the very first day, and those that laugh at them when being an early adopter doesn't go well for them. I am definitively in that second category; my view is that most software has gotten "good enough", so when a new version comes out, you pay a lot of disruption costs for not a lot of benefits. It's been years since a major OS update has shipped a feature I actually care about. Yet the last two versions of X-Code actually have delivered new features compelling enough to make a tool-chain upgrade worth it. X-Code 7 delivered Address Sanitizer, which was a huge step forward in catching memory scribbles. Adaptive Sampling Profilers are spectacular for finding performance problems, because by the definition of their sampling, they are better at finding the code that's taking the most CPU time. If you want to focus your effort on performance problems that really matter, an adaptive sampling profile will tell you where to aim. There's one case though where an adaptive sampling profiler falls on its face: if you need to find a single "slow frame" in a sea of fast frames. Imagine we have 300 consecutive frames, each taking about 15 ms. In other words, our game is running solidly at 60 fps. Then we hit a "slow" frame - some part of the frame takes 60 ms (! ), making that frame 4x as slow as the other ones. This is a visible "hitch" to the user and a bug. But here's the problem: we have 4500 ms of good frames and 60 ms of bad frames. The bad frame represents 1.3% of the sample data. Even if the bad frame is made up of one single 45 ms function call that pushed us past our budget, that function is < 1% of the sample data and is going to be buried in the noise of non-critical every-frame functions (like the 1% we spent on the overlay UI). What we need is some kind of marker, showing us where in the timeline the bad frame occurred. Instruments 8 adds this with the "points of interest" track, which is basically user-data where you can mark what the app was doing. Points of interest is part of the system trace; the system trace is a fairly heavy instrument, so unfortunately you have to use it in Windowed mode - that is, tell it to record the last N seconds, then bail out within N seconds of something happening. Fortunately on my laptop I can run with a 15 second window and the high frequency timed profiler and the machine is okay (barely). I would describe this performance as "usable" and not "amazing" - but then the Instruments team probably has access to some performance tools to make Instruments faster. That puts a single marker into the timeline, and it is what I used to see my frame boundaries. Here's a zoom-in of my timeline - the S in a circle are the frame boundaries - the short spans are solid fps and the long spans are the drops. The middle blue track is VM activity - as you can see, the VM manager goes haywire every time we glitch. I have an SSD and all I was doing was circling around a parked plane, so this was really weird. I took a look at the back-traces around the VM activity and the GLSL shader compiler was being run. You Know That's Really Stupid, Right? One of the purposes of this blog is to act as a confessional for dumb things I have coded; I try to bury these at the bottom of the post so no one sees them. In this case, X-Plane has an inherited legacy that haunts us: on-the-fly shader compile. I will write another blog post about OpenGL and Vulkan and why this will never really be fixed until we go to a modern API that promises to not compile on the fly behind our backs, but for now the thing to note is that as you fly, X-Plane sometimes discovers that it hasn't compiled the terrain shader with the right options for the particular scenario it hits, which is a function of time of day and weather, the particular scenery, the rendering pass, and user rendering settings. In the picture above, you can see the red bars at the very top - these mark the in-frame shader compiles, and they exactly fit the 'extra space' in the long frames. Problem child found! I did hit one dropped frame that did not have a shader compile in the middle - the sim went totally crazy with VM activity, and yet the time profile showed nothing unusual. It didn't make any sense. So I switched to the "core" view, where the system trace shows you what each CPU is doing. I have an i7, so we can see 8 virtual cores. New to Instruments 8, the orange sections are where there are more runnable threads at reasonably high priority than there are cores - in other words, performance is degraded by running out of core count. The play-head annotates what process is running over any given section, and the amazing thing about this trace is that as you scrub over all of those tiny blocks, it's almost never the same process twice. What happened? Chris managed to psychically debug this: X-Plane dropped frames when I hit command-tab and switched out of X-Plane and back to Instruments to stop recording. Apparently every service in the universe on my machine is programmed to briefly wake up and reconsider its life choices when the foreground application changes. The good news is that this kind of crazy activity was not at all present in the regular operation of the sim, and "sim drops frames when wildly changing between other apps" is not a bug I have to fix. * Timeline markers in a profiler are not revolutionary at all. VTune has had this for at least longer than I have been using VTune. But even if a tool-chain feature is not new to the universe, it is still very useful when it is new to a platform if you are using that platform. 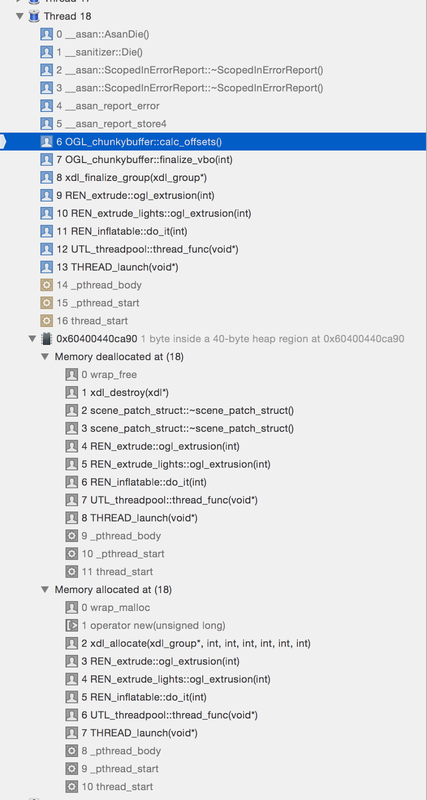 VTune's ability to spot long frames two years ago was of no help to our iPhone app! The distribution of precision in the default Z buffer configuration is not ideal. Precision is distributed via a 1 / x curve. This means more precision close to the camera, and less precision far away from it (which is good) but the curve goes asymptotic near the front, so it uses up too much precision. If you've had to try to tune your near clip plane, you know that bringing that near clip plane in just a little bit makes things much worse in the distance. In order to get correct perspective rendering via a view frustum, our projection matrix has to put our eye-space Z coordinate into our clip space W coordinate. But we don't get to pick and choose - perspective divide is part of fixed function hardware, and all of X, Y and Z in clip space are divided by the same W. So if we are dividing by our eye-space Z for our screen location, we have to do so for depth as well. This is what distributes our depth precision. Now that we have shaders, we have the power to mess with this scheme. Let's say we want our Z buffer to contain an eye-space linear distribution. No problem! At the end of our vertex shader, we just load whatever Z we want, then multiply by our clip-space W to pre-nullify the perspective divide. Perfect! You can use this to have a logarithmic Z buffer, or you can use an eye-space Z buffer in floating point and in both cases you get really great distribution of depth precision. You can have a really, really close near clip plane and still have a huge depth range. All of these custom Z distributions have one thing in common: the clip space Z values distributed across a triangle are non-linear. That is, if we find a point half-way along the edge of a triangle, the Z value that our formula produces will not be the same as the Z value the hardware interpolator produces based on the two triangle corners. When are you non-linear? Pretty much any time you do anything to your Z value that can't be described as Ax + By + Cz + D. So for example, for eye-space linear, if we need to multiply by eye-space Z again, we're not linear. The problem with not being linear is that the Z buffers written by the middle of a triangle may be very different from where it would have been if the triangle was tessellated. If you have a large-ish terrain triangle with a small decal like a rock on top of it, the middle of the large triangle might interpolate to be too close (or too far), causing Z errors. If you have a mesh with layers that requires hidden surface removal and it isn't extremely uniform in vertex density, again, interior interpolation error can lead to Z artifacts. Any polygon that intersects the clip planes is also going to go somewhat haywire, as the clipping changes Z mid-triangle while the camera moves. The above problems are almost certainly a show-stopper for any engine that shows artist-made 3-d meshes. The solution is to move the custom Z calculation to the fragment shader, so it can be done per pixel. This works great from a correctness standpoint - every pixel results in the right Z according to your encoding, but it has a nasty side effect: you lose early-Z. Early Z is an optimization where your GPU runs the depth-stencil test before the fragment shader, instead of after. This is a huge win for any scene with significant hidden surfaces; fragment shading costs for hidden surfaces are completely removed, because the hardware doesn't even dispatch the fragments for shading. Without Early Z, your fragment shader runs, fetching textures, burning bandwidth, consuming ALU, and then throws the result out at the very end when it turns out that, oh noes, you've been drawing a secret base that's behind a closed door. In order for early-Z to be effective, the Z coordinate out of the rasterizer has to be correct - that is, the fragment shader can't modify it. So any scheme that encodes a non-linear depth buffer in fragment shader defeats this. The really bad news is: you don't just pay once. Now that your Z buffer is encoded with a special encoding, anything that is Z tested (even if it isn't Z-writing) has to calculate Z in the fragment shader as well. So for example, particle systems, clouds, and other fill-rate-intensive effects become more expensive. In summary: the need to move a custom Z function to the fragment shader is caused by the very thing that gives it better depth distribution, and this defeats early Z. So you can never have early Z and a super depth buffer distribution at the same time. There is one work-around I have seen that gets around this: use floating point depth and reverse the near and far encoding values; since floating point has more precision at 0.0, you are using the higher precision of float where we need it (where 1/Z is imprecise). X-Plane, like many games, uses two separate Z environments to cope with a very close view (inside the cockpit, where millimeters matter) and the world (where you can be millions of meters from the horizon). This isn't ideal - the cost of separating the Z passes isn't zero. I wrote this post up after having worked out the math behind custom Z encodings (log Z, floating point eye-space, etc. ); I had a todo item to investigate whether we could move X-Plane to a single Z pass and save some overhead. The answer is, unfortunately, no for now. Losing early Z on our particle and cloud effects is a non-starter; we'd need to use a floating point depth buffer. Unfortunately, ARB_clip_control isn't wide-spread enough for us to count on. We'd also eat bandwidth in moving from a D24_S8 integer depth buffer to a D32F_S8 depth buffer (which pads out to 64 bits per depth sample. One last note: X-Plane uses a floating point channel of the depth buffer to write floating point depth in eye space. While we split the actual Z buffer and draw in two passes, we build a single unified G-Buffer; our eye-space linear floating point depth has enough range to span both passes, and lets us then shade our G-Buffer in a single pass. Is Anyone Generating PMREMs In-Game in Real-Time? One of the standard solutions that has emerged for physically based rendering (PBR) is to use pre-filtered mipmapped radiance environment maps (PMREMs). Put in very imprecise terms, a PMREM is a cube map that has a perfect reflection of the environment in the lowest (largest) mip and successively blurrier images in the lower mips. Typically the image is convolved with your material's distribution function at various roughnesses, and a cosine lobe is used at the lowest resolution. From this, specular lighting is sampled from the LOD level that matches material roughness, and a low LOD is used for diffuse lighting. What I haven't seen is any papers on games doing this entirely in-engine. There's plenty written on baking these cubemaps ahead of time, and it appears that quite a few engines are augmenting PMREMs with screen space reflections (with various heuristics to cope with materials being rough and all of the weird things SSR can have). The problem that X-Plane faces in adopting modern game-engine graphics is that we can't bake. Our "level" is the entire planet, and it is built out of user-installed scenery packages that can be mixed and matched in real-time. This includes adding a mix of surface objects onto a mesh from another pack. Baking is out the question because the final assembly of the level only exists when the user starts the app. My question is: is anyone else already doing this? Is this a thing? * You can add a lot more spherical harmonic coefficients, but it doesn't scale well in image quality; the amazing thing about SH are that the artifacts from having a very small number of bands are, perhaps by luck, very acceptable for low frequency lighting. The problem is that, as coefficients are added in, things get worse. The original image isn't reconstructed well (for the number of bands we can hope to use on a GPU) and the artifacts become significantly less desirable. ** To be clear: importance sampling is only going to work for a very, very small number of samples. I believe that for "tight" distributions it should be possible to find filter kernels that are equivalent to the importance-sampled result that can run in realtime. For very wide distributions, this is out of the question, but in that case, SH convolution might provide a reasonable proxy. What I don't know yet is what goes "in the middle". My guess is: some kind of incorrect and hacky but tolerable blend of the two. This was the code to release an art asset in X-Plane 10.45r2. Lock the global table of art assets. While the table is locked, clear out my entry. We should get "more optimal" and drop the lock before we delete ourselves, but that's not the issue either. Try to load this same art asset; it will acquire the table lock, look up our art asset, find it, increase the reference count back to 1. It will then drop the lock, leaving us exactly how we were except our reference count is now 0. When we proceed to nuke the art asset we will leave that other client with a bad pointer and crash. I found this because I actually caught it in the debugger -- what are the odds? Being too clever for my own good, I thought "let's be clever and just re-check the reference count after we take the global lock; in the rare load-during-delete we can then abort the load, and in most cases releasing our reference count stays fast. Another thread takes the global lock, finds our art asset, and increases its reference count, drops the table lock. That thread then releases its reference, which hits zero, takes the lock, deletes the art asset and the table entry and releases the lock. Now we are the ones with a bad pointer, and we crash re-deleting the art asset. So I've come to the conclusion that the only safe thing to do is to take the table lock first before doing any decrement. In the event that we hit zero reference count, since we did so while the table is locked, no one could have found our art asset by the table to increase the count (and clearly no one else already had it if we went from ref == 1 to ref == 0). So now we know it's safe to delete. This isn't great for performance; it means we take a global lock (per class of art asset) on any reference count decrement, but I think we can survive this; we have already moved not only most loading but most unloading to asynchronous worker threads, so we're eating the lock in a place where we can afford to take our time. The table of art assets itself holds one reference count. When we decrement the reference count to one, we queue up an asynchronous table "garbage collection" to run on a worker thread. The garbage collection takes the table lock once to find and clean out unused art assets, blocking loads for a small amount of time while the table is inspected. Here the reference count decrement doesn't need to do any extra work unless it is "probably" finished (e.g. gets down to 1 reference count remaining) so transient reference count chagnes (e.g. we went from 3 to 4 back to 3) remain as fast as we can perform an atomic operation with some acq/rel semantics. I have not had a chance to profile the simple solution since trying to make it correct; if it turns out to be a perf problem I'll post a follow-up. The only time we've seen a perf problem is when the table lock was required for all operations (this was a design that we fixed almost a decade ago -- a design that was okay when it was single threaded and thus lock free). The rendering path in X-Plane requires no reference count changes at all, so it is unaffected by anything on this path. I've been meaning to post this: this is ASAN (Address Sanitizer) in X-Code 7 catching a memory scribble in an X-Plane beta. I don't usually drink the Kool-Aid when it comes to Apple development tools. If you say "Swift Playground" my eyes roll all the way into the back of my head like in the exorcist. My skepticism with Apple tools comes from X-Plane being a big heavy app that aims to use 100% of a gamer-class PC; when run with developer tools on the Mac, the results sometimes aren't pretty. Instruments took several versions to reach a point where we could trace X-Plane without the tool blowing up. In this crash ASAN has not only shown me where I have utterly stomped on memory, but it has also provided a full backtrace to where I relinquished the memory that I am now stopping on and where I first allocated it. That's a huge amount of information to get in a real-time run. A participating client can't delete their chunk of the VBO until after accumulation is finished, but there was no assert protecting us from this programming mistake. When code does delete its geometry "too early", the removed reference isn't properly tracked and stale pointers are used during the VBO build-up process, trashing memory. Suffice it to say, ASAN's view of this is about the best you can hope for in this kind of scribble situation. A good introduction to more advanced parallel task scheduling strategies. X-Plane's task scheduler for multi-core work is a central work-pool, similar to libdispatch and pretty much any basic worker-pool design that isn't trying to get too clever with continuations. Our assumption is that the amount of background work is (hopefully) relatively large; typically the work is "cold" when it's scheduled and is going to a core other than the one running the main rendering lop. And Fedor Pikus on lock-free programming. There's some mind-bending stuff in here. For example, is your concurrent FIFO really a FIFO when used with multiple threads? No one knows, because the only way to test it (from a correct race free program) disallows testing concurrent ordering. Design only what you need, avoid generic designs. Avoid writing generic lock-free code. In other words, making a fully general lock free thingie with no fine print and no strings attached is really, really hard. After you spend more time engineering your super-data-structure than you should have, you will end up with something that has subtle concurrency bugs. Instead, look for chances to simplify the problem in the application space. An example from X-Plane: the APIs around our art assets are not lock-free. But the API to use them is lock-free, and that's actually all we care about. 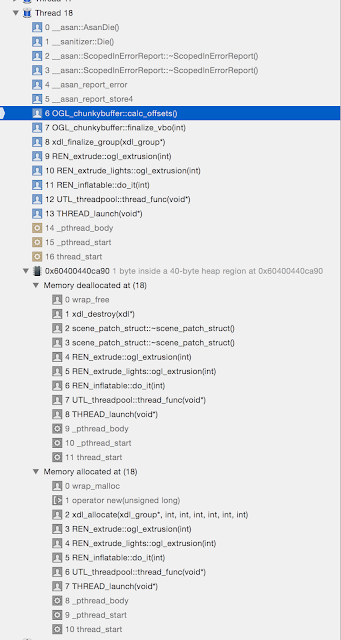 Loading/unloading happens in the background on worker threads and is always asynchronous. It has to be, because the actual work of loading/unloading the art assets is often non-trivial. But once you have a reference count and pointer to an art asset, you can use it with no further checks; the reference count guarantees it isn't going anywhere. This means the rendering loop can proceed and never gets locked out by loading threads, which is what we care about. This isn't a "fair" design, and it's not lock-free or wait-free, but it's unfair in exactly the way we need it to be and it's faster on the path that actually matters.